Submitted by Alexander Briones on Tue, 9 Aug, 2016. Collings' reputation as a boutique guitar builder is ever growing, thanks to the many satisfied guitarists who put their premium handcrafted Collings guitar to good use. Their designs usually follow after traditional guitar builds, and they are mostly known for their regular sized guitars, but they do have a number of fine parlor guitars within their lineup, including the Collings C10. The Collings C10 exemplifies their attention to detail and premium quality in a compact parlor guitar format. According to the company, they designed it following their OM shape instruments, albeit with a leaner profile. The waist is narrower and the upper bout is smaller, giving this instrument a parlor guitar appeal and voicing. And it's not just the body, the neck profile is rounder for comfortable playability, making this instrument ideal for electric guitar players who are looking to transition to acoustic guitars. The top of the guitar is crafted from select solid sitka spruce, while the back and sides are crafted from solid mahogany. The top is supported by what the company calls as pre-war scalloped bracing, which helps in the sustain and tone department. This tonewood configuration gives the C10 tones that are quite similar to regular sized acoustics, but with a more focused midrange because of the smaller body. Cosmetic features of the body include ivoroid rossette, grained ivoroid body binding for the top and back, and black/white wood purfling with walnut backstrip. The neck of this guitar is crafted from mahogany, and is topped by an ebony fingerboard. It has a total of 20 (medium 18% nickel-silver) frets and joins the body at the 14th fret following after more modern neck joints. The shape of the neck is described as medium-fat "C" with a 2 3/16" string spacing. 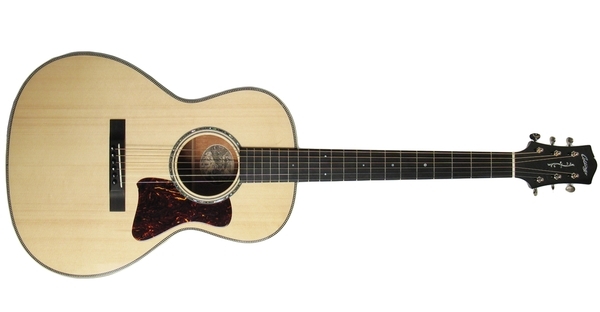 This parlor guitar features a standard 25.5" scale length, while the nut width is 1 11/16". Since the neck follows familiar specs, the playability of this parlor guitar will be more similar to regular sized acoustics. This means that less playing technique adjustments are required to enjoy this instrument. Other features of this guitar include having a fully adjustable truss rod, ebony bridge pins, ebony end pin, Nickel Schaller mini-tuners with 1:14 ratio and an ebony straight-style bridge. The Collings C10 is currently retailing online for around $6000, and it should come with the Collings deluxe hardshell case by TKL. For more information and the complete specifications, you can head over to Collings Guitars.